The heroic rescue of 13 young people from the flooded Chiang Mai cave in Thailand represents everything which is wonderful about humans cooperating and helping each other, and where they are at their best. By stark contrast the cover-up by the authorities and the media of the underlying reasons for the unfolding tragedy of the Hiroshima deluge, in which to-date more than 200 people have died or are missing, tells of an indifference vis-a-vis the advancing spate world-wide of extreme weather events, related to global warming. 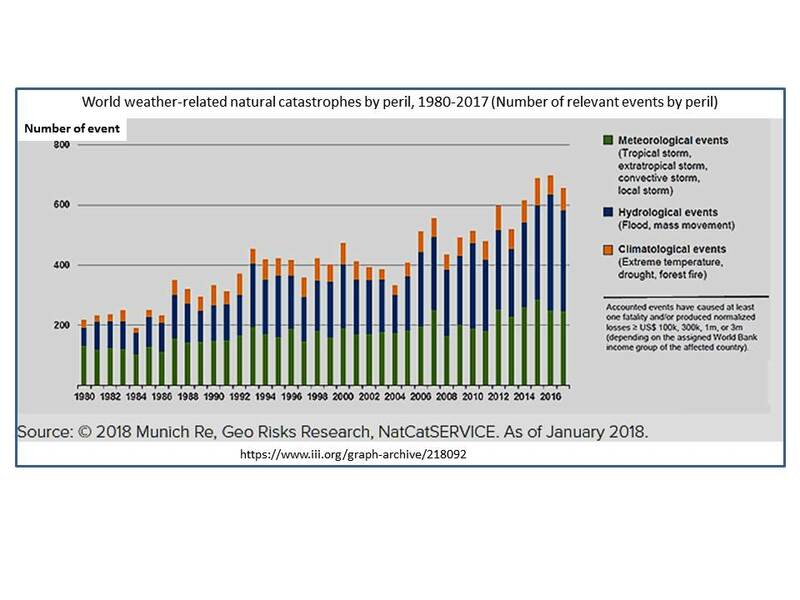 Not that every single storm, flood or fire can be attributed to climate change, but as indicated by global data the trend is ominous, as in the figure below. Under current trends in greenhouse gas levels (~410 ppm CO2 and ~1900 ppb methane, rising at 2 to 3 parts per million CO2 per year), mean global temperatures are projected by the International Panel for Climate Change (IPCC) to rise this century to between +2 and +4 degrees Celsius above pre-industrial temperatures. Under a temperature rise of +2 to +4 degrees Celsius, hundreds of millions of people across the globe face extreme conditions. A recent study published in the British journal Nature Geoscience warns long-term global warming—and thus sea level rise—could be twice as bad as climate models project (https://www.nature.com/articles/s41561-018-0146-0). The recent history of the climate (in particular in the Eemian – 125 thousand years ago), indicates that even a rise of about 1 – 2 degrees Celsius leads toward a rise in sea levels of about 8 meters, with a lag effect controled by ice melt rates, as is currently taking place. A sea level rise of about 8 meters, flooding low coastal and river valleys, represents a calamity for civilization, concentrated as it is on ocean shores and low river valleys around the world. Continuing warming would result in sea level rise on the scale of tens of meters. Global food resources would suffer under intensified draught conditions, heat waves and fires. Current evidence for the rise in extreme weather events includes the recent Caribbean, southeast US, Philippine and Fiji hurricanes, California and southwest Europe fires, and soaring Arctic temperatures, beyond 32 degrees Celsius in Siberia. With the intensification of hurricanes it is uncertain whether oceanic islands, circum-Pacific and Caribbean islands can remain habitable. Acidification of the oceans by absorbed CO2 will affect the marine food chain and destroy reefs. The technologies exist in principle for diverting the $trillions currently spent on “defense”, meaning killing people around the world, into attempts at cooling the atmosphere through down-draw of atmospheric CO2, but this is not happening. Given these developments, the continuing promotion of fossil fuel mining and combustion—coal, oil, gas, oil shale, tar sands—by vested interests and their friends in governments and in the media, amounts to a crime against humanity and nature. To date no legal statutes appear to be available for the defense of the life support systems of the planet.